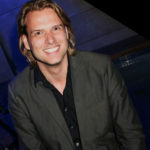 When thinking about Rio de Janeiro, it is not the images of churches that come to mind. 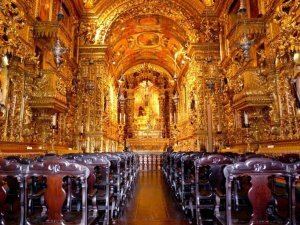 But even though, you will be surprised how many old churches in Rio de Janeiro are worth visiting. For people that love architecture, or are religious, or just for people who are looking for an activity on a cloudy or rainy day. 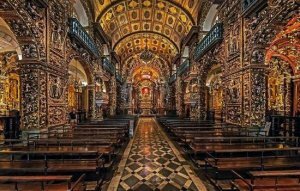 Here we put together a list of the 5 most beautiful churches in Rio de Janeiro. One of the few churches in the world almost completely covered in the typical blue Portuguese tiles, with some details carved in wood. Built at the beginning of the 18th century, It is a small church, but definitely worth visiting. One of the popular places for the rich, and famous, to get married. Before the road was built in front of the church, it was located directly at the Bay of Guanabara. Open from 11:00 to 16:00 during weekdays. On Sunday there are masses at 9:00, 11:00 and 19:00. One of the four hills the old city of Rio de Janeiro was founded on in the 16th century, it is one of the oldest churches in the city. An extra is the view when you walk around the church, pass through a tunnel on the left side of the square. You will have great view of the Bay of Guanabara, the bridge to Niterói and Praça Maua and its Museum of Tomorrow. Open all days of the week from 10:00 to 18:30. 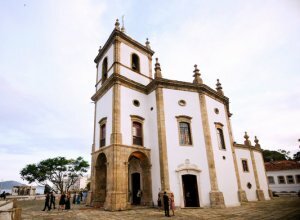 An impressive church that is part of the convent of Santo Antonio. 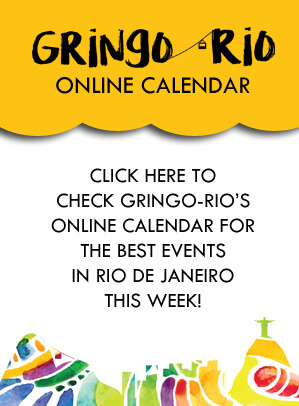 It’s a place in Rio de Janeiro of great historical value, but visited only by few people. Just like São Bento, the hill that the convent and the church are built on, was one of the four hills. Completely covered in gold, this church takes your breath away. You have to pay entrance of 10 real, but it is your money’s worth. Not many churches are as beautiful than this one. Open on Tuesday to Friday from 9:00 to 16:00. Closed Saturday, Sunday and Monday. Another fan favorite for your local wedding. This one is for the elite only. It used to face the Bay of Guanabara back in the days, but now completely surrounded by modern buildings. The most typical Catholic church you will find in Rio de Janeiro. 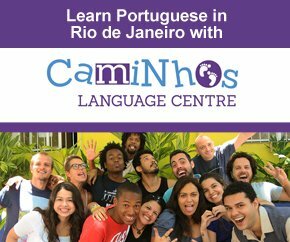 Next to the Olympic Boulevard, a must visit when walking from Praça XV to Praça Mauá. Open on Monday to Friday from 7.30 hours to 16.00 hours. Open on Saturday and Sunday mornings for the mass. This is the traditional touristic site that, if you book a tour or go to explore the city center, you probably will visit. It is not that this church is so beautiful, because it is not. But it is interesting. Built in the 70s, it is a piece of architecture that you at least will remember. 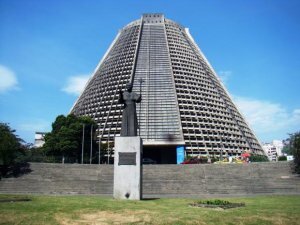 It looks like a pyramid, and it is one. Inspired by the Mayan temples. 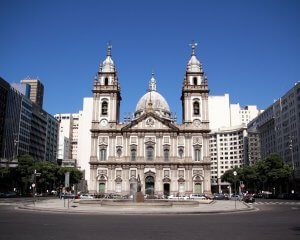 It is the headquarters of the catholic church since the archbishop of Rio de Janeiro holds his mass here. Open all days from 7:00 to 17:00.